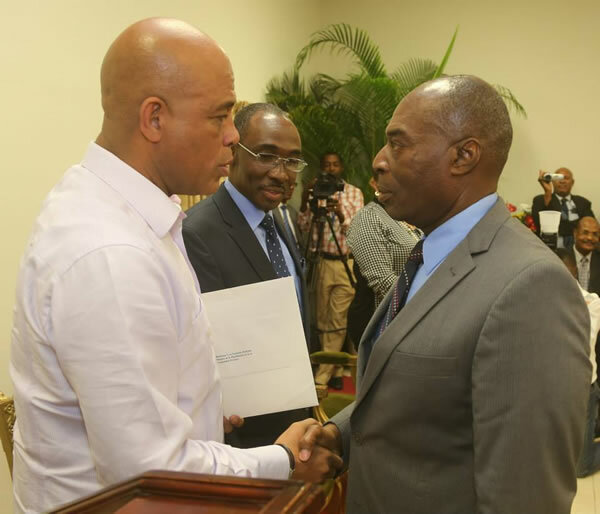 Here is a picture of Minister of Plannification, Yves Germain JOSEPH and President Michel Martelly. When Haitian President Michel Martelly called a vote that would extend parliament and thus facilitate elections for the country, a deal that was being brokered by the United States, members of the political parties of the opposition failed to show up leaving the proposal floundering. The opposition has made their feelings - that the President has played a game to place himself in the de facto position, ruling by decree - and also their intentions - to keep their protests alive until they accomplish their one mission, to get the President out of power - well known. Haiti isn't new to political unrest, as the world has seen documented, but in recent years, a new era of democracy had begun and hopes were high for that to continue. When issues began last year that would lead to the current dissolution of parliament, the governing administration blamed the opposition senators, and they in turn blamed the President.